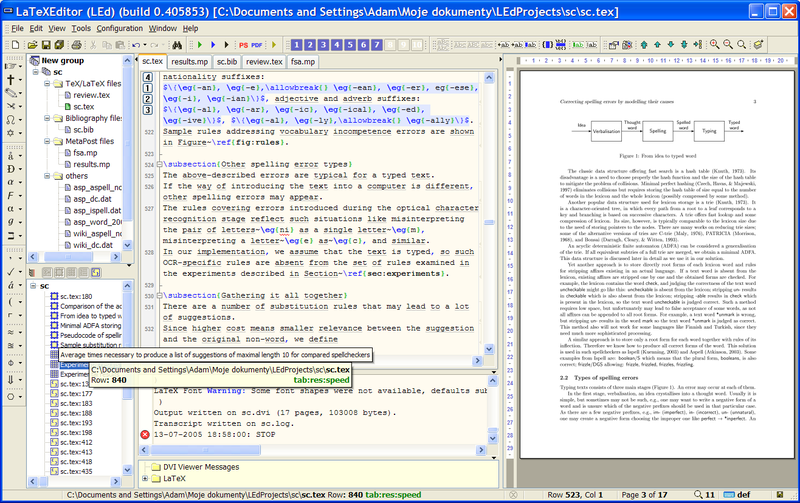 I just looked at that site, and (AFAIK) all they talk about are tools that you use to write LaTex source code, and then compile it into (what you hope will become) the document you intended it to be. IMHO, "code" based editors went the way of the Dodo back with WordStar running on CPM based S100 systems, and Word Perfect 5.1 for DOS 4.1. The editor for the blog I write, (http://www.qatechtips.com), is a WYSIWYG editor that has both a "compose" pane, and a "html" pane. 99% of my time I spend in "compose", switching to "html" when things go awry, or when I want to implement an HTML feature that is not included in the stock toolbar - like horizontal lines, em-dashes, non-breaking hyphens or special typographical symbols. Word Perfect's primary workspace is the "editor" window which is as pretty darn close to WYSIWYG as you can get. If you need more granular control, you can open up the "view codes" pane and actually edit the behind-the-scenes codes that make the text do what you want. Likewise, (AFAIK), nobody but the most masochistic among us write full blown web pages in html source. Seriously now, which would YOU rather code software in? C / C++ etc.? Or assembler, or even worse, raw binary? Of course you want the "higher level" language tool! Programming a project of any size at all in assembler is masochistic to the extreme, and trying to code in hex, is way beyond insanity! And yes, I know wherewith I speak, having done both. I am perfectly willing to support LaTex as the de facto source language for the FlightGear documentation, but I would really like to know if there are tools out there that I can use to concentrate on the document itself instead of the behind-the-scenes code that creates it? It's not cheap, but if it does what it claims to do, it might well be a Hot Smokin' Weapon! Wellcome Jim (Junior). I liked your article about your first impressions using FlightGear. It is clean and funny, loud and clear. There is an extension : https://www.mediawiki.org/wiki/Extension:Wiki2LaTeX. Get the process of posting information that can be later strung together in a manual. My advise would be to use these forums in such a way as the knowledge that is here gets used with the manuals..
And also accept the feedback from those that read the manual, if its not easy to understand, take their word for it. Bomber wrote in Wed Nov 21, 2012 11:05 am: My advise would be to use these forums in such a way as the knowledge that is here gets used with the manuals.. I'm agree. For that reason I started In 2011 an open source FlightGear Q&A free service. Still is alive, however it seems that admins have change their and mine css. For strange reasons this free service has no more than 13 users. I told about this service here and in the wiki, in order to integrate it in FG structure, but with no so much success. I think this app can be use it for every category we need to use, from bla bla bla Q's, to the most technical deeper Answer. As I published in http://wiki.flightgear.org/FlightGear_Newsletter_July_2011. Anyway some of the answers are based on wiki info or contains hiperlinks to our wiki. But the service has itself a wiki integration. Everybody is free to improved it, with support in different languages. Last edited by Michat on Wed Nov 21, 2012 9:39 pm, edited 2 times in total. Michat, don't take this personal. This is a long-standing FG problem. It has often taken many attempts (and years) to establish new infrastructure parts. Such as for example the wiki, the forum or the issue tracker. None of these were directly adopted. Q&A/Knowledgebase solutions have been proposed (and even prototyped/implemented) by other users (such as ac001), but the feedback has not been too encouraging. The thing is, that you obviously need content providers - i.e. people who populate a new system and actually use it. Personally, I'm only interested in contributing to a resource that is "official", in that it's hosted at flightgear.org, so that Curt and others can help maintain it, and most importantly: regularly create backups, to ensure that contributions/data isn't lost. I have previously contributed to a handful of other FG-related "external" websites, and most of them have disappeared over time, with contributions being lost. Back then, Curt mentioned having mySQL related server issues so that he didn't want to host the FG wiki - this has obviously improved, since the forum and wiki are both now "officially hosted". But, personally, I am still concerned whenever I see external websites that cannot be controlled by the "core team". This is because I just understand that most of the contributors here are likely to take their time off and disappear for months or even years (including myself). Thus, such criticial infrastructure parts (forum, wiki, issue tracker etc) must be maintained by "core people" like Curt, who have been around for many years, and who have maintained the infrastructure through all these years. No problem, my friend. Its nothing personal. of course Your a hacker of honor and honesty in FG. I'm totally agree with you on every point. It was hard to come here at present time. I'm also so strict and critic. Even to me nothing that is outside of terrasync exists. I think you understand that the purposed of the site is for to show it as a demo. Due to a lack of responses in my initial proposal at forum, days after, I decide to create it. The code is available under GPL, so for that I thought it was good for FG integration. Because its a forum and wiki GPL manager. Too far to be a programmer. I decided create it as a free demo for non commercial use that allow free hosting from the good guys of shapado. Without doubt I can close it if doesn't nothing help. actually, before you really shut it down, it would probably make sense to get in touch with other people who have previously raised similar ideas - maybe you can team up with with 2-3 other guys and create a compelling demo that can be adopted by the project and hosted at flightgear.org? Bottom line being: Changes are ideally not just "suggested" but literally "made" in the sense that a compelling demo is provided and a handful of contributors are convinced to adopt a new resource and contribute to it. Michat wrote in Wed Nov 21, 2012 11:00 pm: Hooray. Thank you for your kind words about my FlightGear article. Don't be in a hurry to shut things down. Sometimes it just takes time, sometimes a LOT of time, for things like this to get noticed and get followers. 1. I thought it might help other people. 2. I wanted to write it. Even if nobody else read it, I enjoyed writing it. When I started writing my blog, it appeared that NOBODY wanted to read it. But - since I enjoyed writing it, I continued writing articles for it. If nobody else wanted to read it, it was still fun for me to write and I wanted to continue writing for it. Slowly, slowly, slowly, very slowly, it began to be noticed. A web-site visitor from here. A couple of visitors from somewhere else. Then, it started getting referenced - a friend of mine cited one of my articles in a Software bug report. Someone on one of Microsoft's TechNet forums referenced an article I wrote about Outlook. Slowly, slowly, slowly, I began to see comments added to some of the articles. I now have a small, but loyal, following and I usually get hundreds of visitors from all over the globe each time I post a new article. I'm not as big as Wikipedia, ( ), but people are beginning to think that my blog is useful and more and more people are beginning to read it. Your contribution is something I have never heard of until today - and I am still not sure what it is supposed to be, but if you remind me where it is, I will go look at it. Be patient. Babies do not grow up over night. p.s. "JR" in this case does not mean "junior", though I can understand your confusion. Many years ago, I worked at a company that had someone else named "Jim Harris" (also my name), so there were now two of us with the same name working at the same company in the exact same building. To avoid confusion, people gave me the nickname "JR" (my middle initial is "R"), so that they could tell us apart. I have used that nickname as a part of my signature since then. Jim, about the manual, what do you think is in most need of correction or of updating?